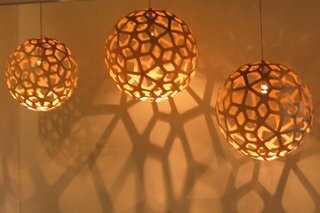 David Trubridge's Coral Light is a refreshing reminder that the simplest design can offer the most satisfying results. The lamp is actually constructed of 60 individual plywood pieces which fasten together with little rivets. I love how the skeletal structure fills the room with beautiful shadows too. The Coral Light, as well as the designer's other wooden creations, can be found at greenergrassdesign.com.